There’s an app for that, as Apple’s popular trademarked phrase might put it. It seems that nowadays there’s an app for just about everything and tea is hardly an exception. I’ve reported on various tea apps in these gadget reports every now and then. But the good people over at the Apple-focused publication Mac Life have done us all the favor of putting together a list of eight of their favorites. If you thought that tea was just for drinking, well, that’s just not true. Tea as a flavoring for ice cream is not a totally new notion and it’s one that I’ve written about before. But here’s an article from a Connecticut-based paper about a local company that offers a line of tea-infused ice cream that uses teas like Earl Grey, matcha, and Assam as flavoring agents. Smearing tea all over yourself might not be one of the first uses you’d think of for tea, even aside from drinking it. I’d still rather drink the stuff, but if you’re interested in white tea, Rooibos or green tea used in a variety of beauty potions take a look at this brief article. What is it about tea (or wine, for that matter) that causes your mouth to pucker up when you drink it? The term for this is astringency and, as a recent article in Scientific American notes, it’s the tannins in wine and tea that actually cause the astringency. In modest amounts this sort of thing is not so bad and can even be desirable. As the article says, “Their astringency is off-putting to virtually all plant-eaters, from insects to birds to reptiles to humans, though in the right concentrations, they lend pleasant complexity to tea and wine.” More details on how it all works here. There’s more than one way to skin a cat, as the story goes, and there’s also more than one way to make a cup of tea. One lesser known method is cold-brewing. If you’re in the market for a stylish looking gadget that allows for doing so take a look at the Hario Filter-in-Bottle Cold-Brew Tea Maker. 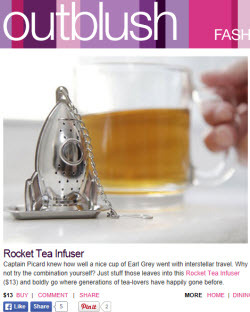 Last of all, because no tea gadget report is truly complete without a novelty tea infuser, here’s a clever one that’s shaped like a rocket.